Nice stocking filler or an addition to a kitchen play-set. Next cheapest is eBay £14.39. I don't really think its worth the RRP but at just over £4, its not bad. 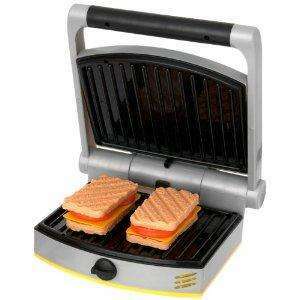 Lift the lever to open the pretend grill, place your panini or waffles on to the grill, close and turn the dial. Got excited thinking this was real, then saw the word "pretend" in the description. Doh. Just cancelled it, it's a toy ??? You thought it was real? Plenty of ebay sellers just gone and ordered lots to sell using one click buy it now button. Now wouldn't that be funny when they open the boxes and realise they are toys. I nearly ordered too, need to change title. I updated the information but its not going to be seen. Lol, I image loads have ordered. You need to edit the title op. it's misleading. Thanks, just ordered one for my daughter for Christmas. How can this deal possibly get hot it doesnt even have a plug, lucky for you im not here all week. can you cook sausages and burgers in it? LOL It's a toy and I thought it was a real one! I hope the OP steps on a Lego one day ..
OOh bargain I thought and then saw the comments! What a fantastic idea, teach your children how much fun it is to play with a burning hot kitchen implement ! What a fantastic idea, teach your children how much fun it is to play … What a fantastic idea, teach your children how much fun it is to play with a burning hot kitchen implement ! I do worry when a child needs a toy waffle maker to pretend to make waffles. On the other hand when I think of the amount of invisible waffles I have eaten that were not properly cooked. I will be glad when my child has this and can actually time them properly. To be fair I tried to read through the product details. It just seemed like a load of waffle.